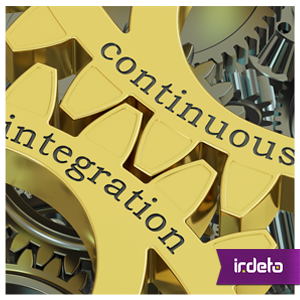 Continuous Integration, also known as CI, is an important part of modern software development. In fact it is a real game changer when Continuous Integration is introduced into an organisation, since it radically alters the way teams think about the whole development process. It has a great potential to enhance the development process from continuous build integration to continuous deployment. A good CI infrastructure can streamline the development process right through to deployment, help detect and fix bugs faster, provide a useful project dashboard for both developers and non-developers, and ultimately, help teams deliver more real business value to the end user. In short, Jenkins monitors your version control system for changes. Whenever a change is detected, it automatically compiles and builds the application. If something goes wrong, it immediately notifies the developers so that they can fix the issue immediately. 2. Why Jenkins in the cloud? 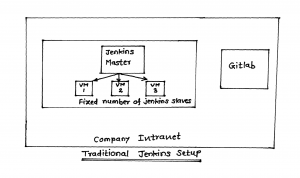 Jenkins is a monolithic application based on a combination of a master and slaves. The Jenkins master monitors sources, triggers jobs when predefined conditions are met, publishes logs and artifacts. It does not run actual tasks but makes sure that they are executed. The Jenkins agent/slaves, on the other hand, do the actual work. When the master triggers a job execution, the actual work is performed by an agent. We cannot scale a Jenkins master. We can create multiple Jenkins masters, but they cannot share the same file systems. Since Jenkins uses files to store its state, creating multiple instances would result in completely separate applications. Since the main reasons behind scaling are fault tolerance and performance benefits, none of those goals would be accomplished by scaling the Jenkins master. But if Jenkins cannot be scaled, how do we meet performance requirements? Well, we can increase the capacity by adding agents. A single master can handle many agents. In most cases, an agent is a whole server (physical or virtual). It is not uncommon for a single master to have tens or even hundreds of agents (servers). In turn, each of those agents runs multiple executors that run tasks. 2.2 How is this limiting your development process? Jenkins is mission critical in many development projects. Release management is blocked if the Jenkins server is down. The speed of development is unpredictable and provisioning for the peak load while provisioning slaves is a waste of a lot resources given that for a team that’s not globally spread. These Jenkins slaves are utilized only for the office working hours typically 8-10 hours a day. Everything fails sooner or later so we should be ready for failure recovery. As we saw Jenkins agents are spinned up and terminated when job execution is completed. The Jenkins master needs to run all the time in order to keep Jenkins up and running. Hence, the Jenkins master is a single point of failure. Regular backups can be taken for the master but, there is no guarantee that backup will succeed. Any backup is unreliable. Cost of recovery is high. Even though backups are there, someone needs to manually recover the backup and setup a new Jenkins master. This is a time consuming task and the whole development team is blocked because of it. You need to do a whole lot of over-provisioning for a given throughput. Any spike in use makes the quality of service bad and can potentially make it unusable. 3. How can a reliable and self-healing Jenkins environment be setup? As discussed in the previous section, the traditional Jenkins environment has many disadvantages and poses risks when we lose the data. 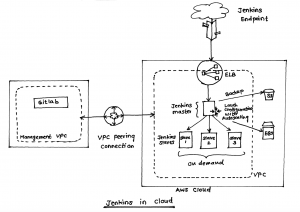 In the following sections, we discuss the guiding principles of a self healing, reliable and scalable Jenkins environment that runs in the AWS cloud. 3.1 Advantage of going to the cloud? The following are some of the many benefits of running a Jenkins environment in the cloud. AWS provides a variety of instance types, use instance types to define various slaves labels. And use the slave best suited to the job without over or under provisioning computing resources. Below picture shows the architecture diagram of self-healing Jenkins in the cloud. Unlike traditional Jenkins, we get on-demand slaves as and when new build requests are in the queue. This makes Jenkins highly scalable. Self-healing Jenkins means that in any unforeseen circumstance the Jenkins master is terminated, a new master comes up automatically and all the global configurations, build jobs and state are restored without losing any data. When you spin up the Jenkins for the first time, EBS volume “EBSVolumeID” should be created by passing “create” as a default value. “EBSVolumeSize” Should be with the value depending on the EBS volume size requirement. For EBSVolumeID, below condition is checked. For the very first time it has to satisfy below condition true by passing “create” to EBSVolumeID. Principle of least privilege is followed. Using security groups, only required sources are granted with access. Access Control is the primary mechanism for securing a Jenkins environment against unauthorized usage. Using Jenkins 2. The Job configuration is part of the code. Jobs and infrastructure are managed as code. They go through the same review process as normal code. Security can be further strengthened by encrypting even at the instance level (apart from EBS provided encryption) using LUKS. Enhancing security at the instance level through IP table based firewall, this can be useful in case AWS security groups a bypassed by a hacker. Multiple levels of security defence helps. Monitoring the Jenkins – Possibly Nagios or something else to monitor that the whole Jenkins infrastructure is running smoothly. These principles can be extended to other cloud infrastructure providers such as Azure, GCP and also to the internally managed company cloud based on Open stack. This entry was posted in How-to, Practical Guides. Bookmark the permalink.